Looking through the early works of Indian photographer, Sunil Gupta, I’m struck by the purity of their intimacy and the easy way in which he captured the warmth of his subjects. Gupta did not yet identify as an artist when he created the works, now on view at Stephen Bulger Gallery in Toronto. He was still a recent immigrant to North America who saw his interest in photography as a hobby. And yet, the images offer a profound documentation of an emerging gay liberation movement in Montreal during the ‘70s. The snapshots quietly record spaces in the city, both domestic and public, where that movement took place. They capture the intersection of these quiet, surreptitious moments of love and friendship alongside one of the largest political revolutions of the 20th century. The exhibition begins unassumingly: a photo of Sunil, referred to by first name in the title of the piece, and his parents, Ram and Penny. They stand next to one another at the entrance to a two-story home replete with white columns and a gable. 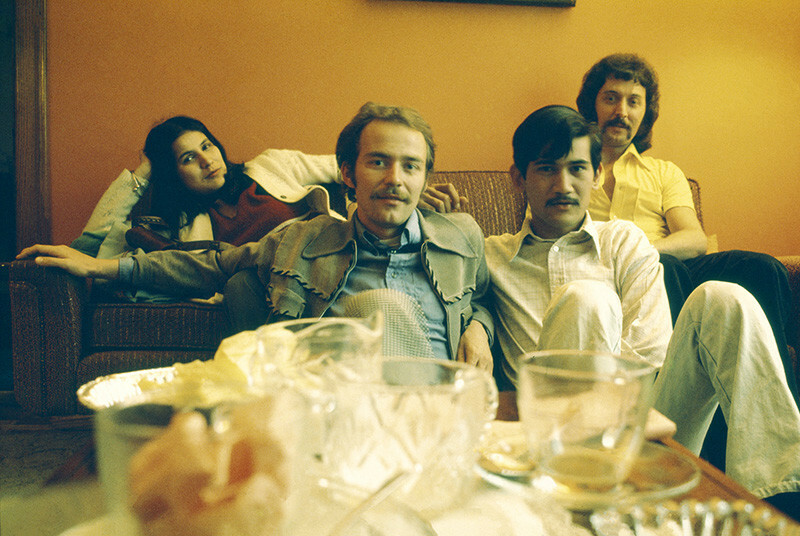 Sunil on the left, his father in the center, his mother on the right looking at the camera: her body faces away from the camera, towards her family, her arm linked around the stiff wrist of her husband. Sunil stares out over a neat mustache, his hands in the pockets of flare leg jeans pushing back the front of a brown blazer. Penny wears a Shibori dyed sari, brown kolhapuri sandals on her feet; Ram, a sports coat and short tie. The photo is taken six years after they’ve moved to Montreal. They could be any immigrant family. The portraits that follow, like any photographs, capture the movement of the young artist through space and time. Moving along in the gallery, I see him on a military base, photographing a young man shave in the open air, half his cheek frosted in white, shaving cream; a Canadian tank in the clearing of an evergreen forest somewhere you can see the purple outlines of mountains against a silvery blue sky. He is seventeen or eighteen taking these photographs of the environment he was exposed to. The same age in the photograph of him hitchhiking back to Montreal from the base. These early works, almost unremarkable in their everydayness, show a teenager considering the world around him. They mark him in school; beginning to study accounting; beginning to build relationships in the continent he moved to at the age of 15. The year is 1971. That same year, Sunil Gupta enrolled in junior college, going on to study sociology and anthropology. He describes how the liberal environment of the school brought him to consider feminism, sexuality, and race for the first time in an academic environment. 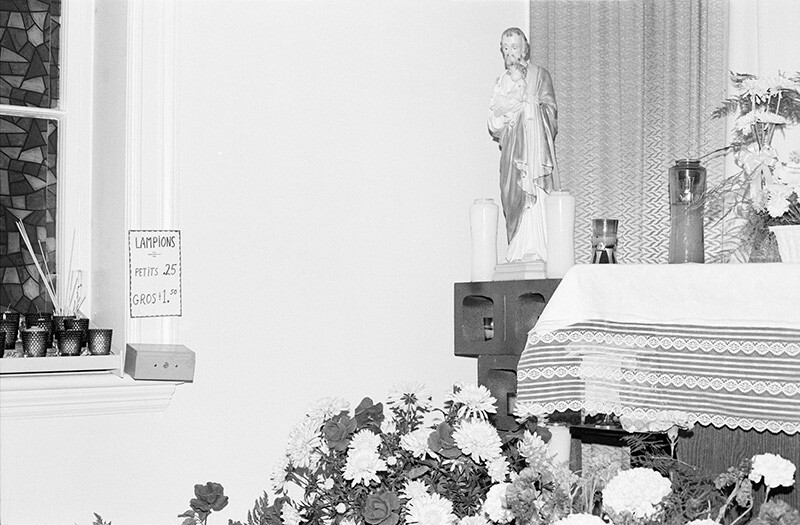 On the next wall, photographs are dated beginning in 1973. It is four years after the Stonewall Riots, largely considered to be the most significant moment in the history of queer rights in America. Suddenly, it was okay to be visibly queer. Gupta’s photographs in this next period reflect that visibility and his new exposure to a movement of queer liberation. His lens turns towards the Montreal he has begun to discover. These are the spaces where it had become acceptable to break free of heteronormativity: the leather bars, discos, and, most evocatively, the private domestic spaces where he and his friends expressed sexuality and gender freely. The photos, taken primarily in home, especially Sunil’s apartment at 3425 Stanley, convey warm familiarity between photographer and subject. In Fakroon, for example, the eponymous subject leans back, elbows propped against a car parked out of the frame, shoulders held slightly forward and open. The photo is taken at close proximity, framing its subject at his bust. He wears a moss green halter top, the words “sweet cream” poured into bubble letters from a transparent bottle emblazoned on his chest. His black hair is parted, choppy Farrah Fawcett waves frame dark eyes gazing openly on the photographer, at his lens, at us on the other side of the frame. Fakroon appears elsewhere in the exhibition, pictured with an afro and black overalls sitting next to Gupta’s partner at the time, Rudi. 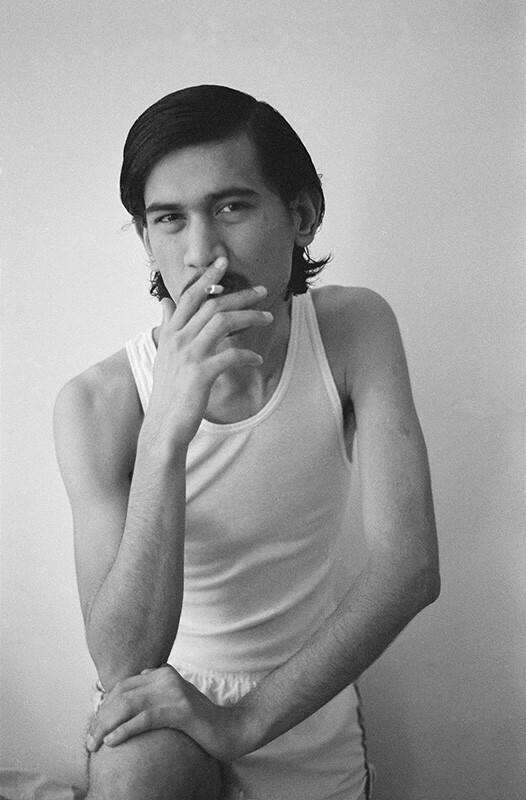 Fakroon is quoted on the wall of the gallery, between photographs: “Those were halcyon times, our salad days indeed…raising ‘our consciousnesses’ and creating a lifelong family of friends.” It is radical, this representation of the queer brown face in the gallery, a dignity lent by the obvious intimacy between photographer and subject. It is radical to remember that the community the images represent could only have existed in quiet corners, in the privacy of one’s home or perhaps in one of a couple dozen places if one lived in a larger city. Other faces grow familiar as one walks through the galleries, the faces of the intimate community Sunil established for himself in Montreal: we recognize Rudi, his lover of ten years, with Sunil, leaning, arms folded above his head against the wall in his apartment; we’re introduced to Sunil’s sister, Shalini who elegantly roams the city in gold-embroidered saris with cropped blouses, white denim jacks, and flare legged jeans paired with kurtas, equally confident in each ensemble. The same intimacy established with Fakroon is present with each member of their circle, quotes from each person in the photographs describing the blissful amity of those years before the AIDS epidemic. There is no sense of the oppression, of the political tension of the decade, or of the violence perpetrated against the gay community, not because the oppression didn’t exist, but because in the quietude of these private moments, the most palpable feeling is still one of love. Turning away from the openness possible in the domestic space, Gupta photographs the public arenas where open expression would have been possible, capturing the innocuous exteriors of the drag clubs, piano bars, bathhouses, and cruising spots listed in the Montreal’s Gay-zette’s “Gay Guide,” excerpts of the which are hung among the photos. Without reading the guides, the spaces are anonymous. There are no hints to their purpose or to the clients they catered to. In one photo of La Rose Rouge, a piano bar, an unknowing pedestrian blurs the photograph, turning to see what the Indian man across the sidewalk is trying to snap behind her. Gupta reminds us that these public spaces did not exist without their risks. 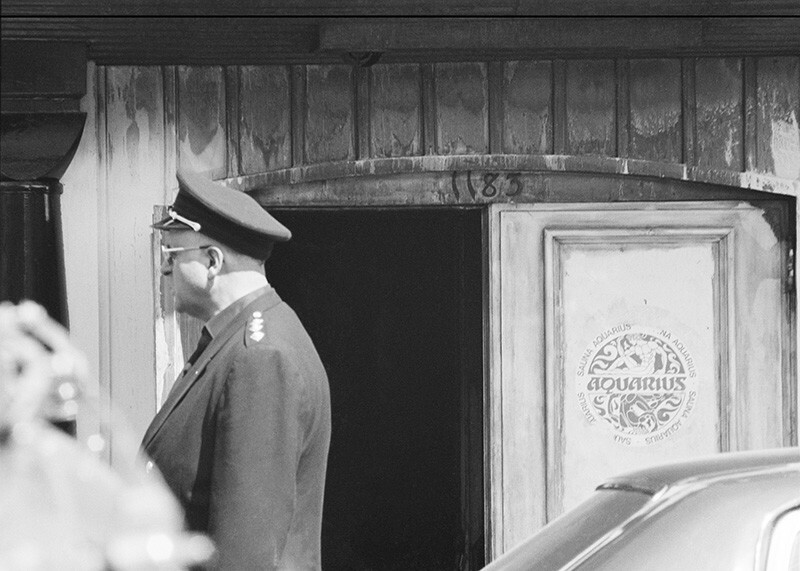 Another photo shows an officer standing in profile in front of the Sauna Aquarius, a gay-owned bathhouse. A newspaper clipping adjacent to it informs us that three people died in the deliberate firebombing of the space. Two fires had been set there in the previous month before the final one destroyed it. We are reminded that to be gay, even in a center of the liberation movement, was to be subjected to acts of terrorism. The power of the quiet spaces depicted in the portraits is thus amplified as Gupta’s lens turns directly to the political realities of the decade. Another series of photos documents marches and protests taking place in the city during the same decade. We see the open mouths of protesters calling out, signs with slogans urging gays to militarize and demand their rights. In another, a statuette of Jesus flanked by two candles presides over the lace covered casket, its occupant left unnamed. The photograph, unlike the rest which are named after the people they depict, is evasively titled C.H.U.M. The sterility of the white wall, the absence of human presence emphasize the erasure of the person in the casket, the irreversible loss of that soul and the tragedy that accompanied the same blissful period of the young photographer’s life. Perhaps it is Gupta’s awareness of and involvement in this political fight to live free from oppression that makes some of the most poignant portraits in the gallery the ones he takes of himself. Silvery black and white prints of the same dark haired boy with the mustache we saw in the family portrait, but here reclined against a wall in nothing but white briefs. A cigarette dangles between his index and middle finger as he reads the New York Review of Books – the Christmas Issue from 1975. His eyes are focused, brows furrowed. He holds the broad, newsprint from the top and we see its shadow draw a thick black line against his ribs. The portrait feels candid, easy – the natural expression of a body in a quiet moment, neither overtly sexual nor repressed. Even amidst the chaos of the time, the violent threat issued by society against just the idea of his identity, he can lose himself in an article about Homer or Shakespeare. Gupta is not the first photographer to explore the queer body in his work. But he is one of the few to try to capture the ever-changing nature of a queer brown subjectivity. It is a question that he admits his work constantly chases, a question evidenced across his four decade long career in photographs that go beyond himself to document queer communities of color in London and Delhi, in the future portraits he’ll take of his struggle with AIDS and solitude. In a history of art that privileges the gaze of the white artist, Gupta’s work reminds us that these documents of his personal history cannot be untangled from the political implications of his racial and sexual identities. He asserts that identity fearlessly, without qualification or emphasis on the theoretical ideas that would devalue his personal investment. In another self-portrait, this one from 1973, he gazes directly at the camera. The cigarette, in the same hand, between the same fingers, is held between his lips. His eyes smile, withholding a joke we won’t hear. He wears a white undershirt and short white shorts. His hair flips flirtatiously just above his shoulders. Something about these pieces holds my gaze, clenching at a space in my chest, warming the muscles around my shoulders. Sunil holds the gaze of someone who belongs in their body, of a person who refuses to be silenced or forced into hiding because of political oppression. His freedom is palpable, his eyes emanating defiance and resistance in an image of radical self-love. “Friends and Lovers—Coming Out in Montreal in the 70s” is on view at Stephen Bulger Gallery in Toronto through May 26, 2018.